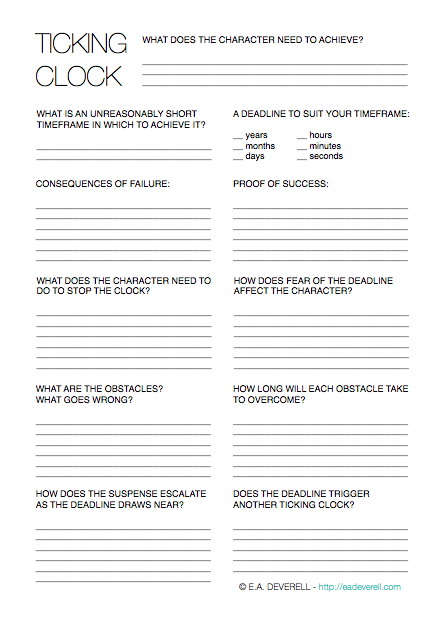 A “ticking clock” is a great way to add suspense and purpose to your plot. Depending on your story, the clock can be the time of your character’s favourite TV programme, the last call for drinks, a big round birthday, the time at which the carriage will turn back into a pumpkin, or the countdown timer on a bomb an oven. If you’re working on a longer story, your plot will almost certainly include a whole series of ticking clocks, with deadlines (or “dreadlines”) of shorter duration. Cause each clock to trigger the next until you reach the end, and you’ll have the bones of an exciting tale. Time’s ticking, get writing! Quick, before this message self-destructs!